As every year, the ARG forgoes Christmas presents for its business partners. Instead, ARG supports the “Marler Tafel”, a non-profit organization whose 20-year volunteer work for people in need deserves recognition. The organization has been collecting foods that can no longer be sold for a variety of reasons for nearly two decades, to support low-income people. The products are given a very good use and with the work of the volunteers help make life a little more liveable for the people. 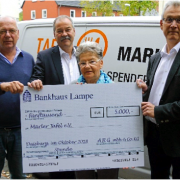 Therefore, this year the “Marler Tafel e.V.” receives the deserved donation.